Faces of ACEs Video Showing at Savoy Theater Great Success! 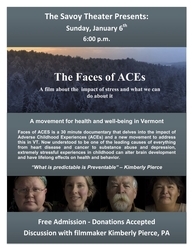 It was a full house last at the Savoy Theater, in Montpelier VT), to see Kim Pierce's video, "Faces of ACEs." They had a second showing since not everyone who had come out on a windy, snowy Sunday evening could get in for the first showing. The video is a very moving account of Kim's work screening her patients at the Plainfield Health Center for ACEs, and their responses to the screening. It is clear that the discussions about ACEs and their connections to life patterns is transformative for the patients. Kim does an excellent job providing her patients information and then support as the conversation proceeds. Her caring and commitment is evident, and her skill is impressive. Kim also interviewed me and Priscilla White in the video about our work to bring Dr. Vincent Felitti to Vermont in 2013 to engage the medical field (which is when Kim learned about ACEs), and the subsequent work that resulted in Building Flourishing Communities. I know there is interest in having the video shown at other areas around the state. Kim works full time as a physician's assistant, and her time is limited, but if you would like a showing, respond here and we'll see what we can do. We would love to show the video as part of our monthly consultation group for our direct service providers. I saw the notes that the video is not available for general release, but that online screenings might be possible. I would love to explore that option for our agency if possible. It is a very well-done video and gets a great response from everyone who sees it. As it is, it doesn’t really stand on its own, however – the woman who made it set it up to be shown as part of other ACEs kinds of presentations. She isn’t releasing it for general use right now, but its possible we arrange a showing on-line. Is that something we could do via ACEs Connection? And mental health can be protected and improved – just like physical health! The woman who produced the video is not releasing it publicly. Maybe we could arrange a showing for you, though, on-line. Let me talk with her about it. This sounds fascinating, Kathy. Is there any way we can get a copy of the video? I would love to see the film with my professional colleagues who are therapists with a broad range of clients. We specialize in systems therapy and are well aware of intergenerational impacts. It would be enriching to see a film that helps clients face and understand the impact of their families and childhoods. Please let me know how this can be arranged?? We are in Philadelphia.